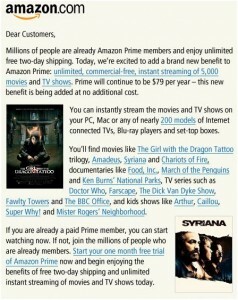 New – Another Reason to Get Amazon Prime: Streaming TV! Earlier today I popped onto Amazon to search for something and saw this note from Jeff Bezo, CEO of Amazon, on the homepage. At no additional cost to Amazon Prime members, there will now be over 5,000 tv shows and movie available for streaming tv. I’m so excited! I already love having Amazon Prime – the two-day shipping is more than worth it, so to have another option for streaming tv (we use Netflix often for this very reason) is pretty great! It’s $79 a year to have Amazon Prime and you can add up to 4 family members to also enjoy the two-day shipping deal with your membership.